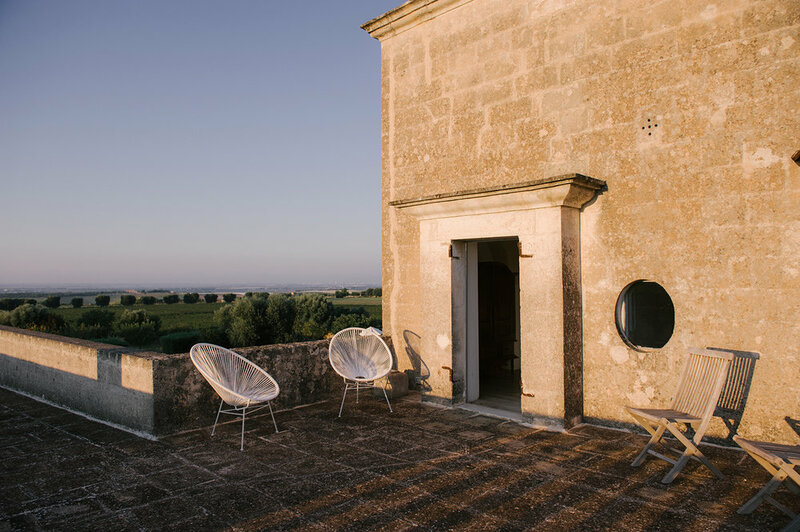 Located 5 minutes outside of Grottaglie, an artful town world-renowned for its ceramics and grape production, you will find the elegant country estate of Masseria Anguilli Piccolo. Abandoned for years with trees growing inside, the extensive restoration was led by Kristine Standnes, Norwegian architect owner who is the soul behind the Albeli Project. Through great lengths, its original history and tradition was retained, resulting in an authentic 18th Century farmhouse featuring vast vaulted ceilings and ancient stone floors seamlessly blended with modern design elements such as the professional industrial kitchen. 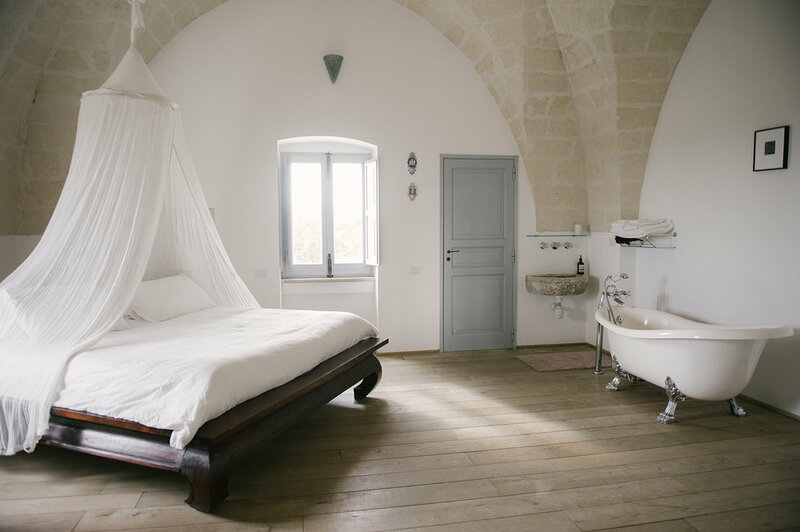 The large farmhouse is surrounded by over 400 hectares of private vineyards, olive groves and orchards, providing a calming environment, and also supplying the kitchen with seasonal produce. 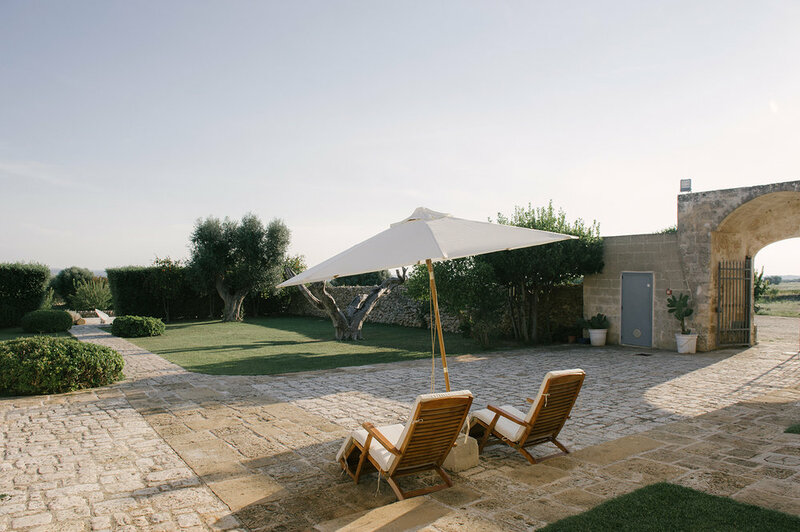 The experience of Masseria Anguilli Piccolo extends beyond just a vacation home, it is a creative place that connects you to tradition and nature, inspiring wellness, togetherness, and appreciation. The main house features a great room with a spectacular fireplace, lounge area, bright dining area and a modern industrial kitchen. There are 5 en-suite bedrooms and 2 large terraces, perfect for taking in the incredible views. Closer to the pool is the guest quarters, with 2 additional en-suite bedrooms. The home is furnished minimally but elegantly with both vintage and modern pieces to harmonize both the old and new elements. 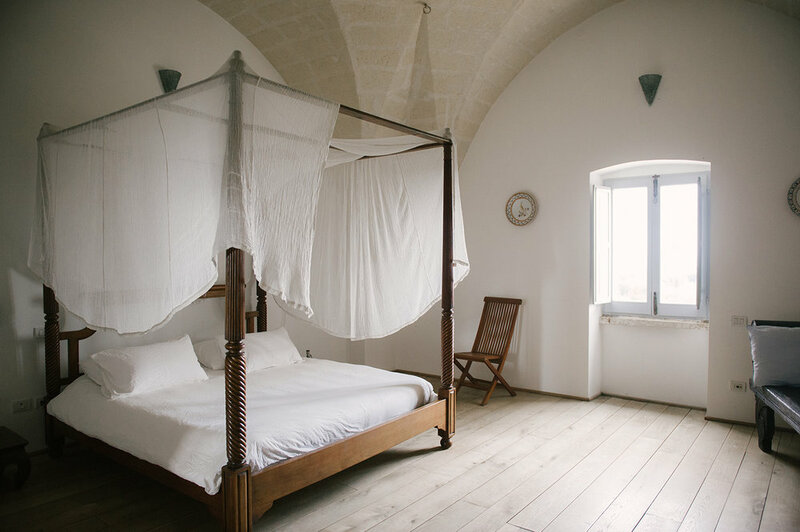 The bedrooms feature powerful wooden furniture, some with canopy beds draped in silky gauze, another with a vintage claw-foot bathtub. The entire home is decorated with gorgeous ceramics from the famous pottery town just 5 minutes away. The estate sleeps 13 comfortably in 7 en-suite bedrooms. As much as we loved the interior spaces, it’s the expansive outdoor spaces that really leave a lasting impression. Just off the main house is a large courtyard with a pergola covered terrace and grassy areas, ideal for the children to play. The large swimming pool faces the gorgeous countryside and features another shaded dining area and sun loungers to enjoy the long summer days. Enjoying a sundowner on the rooftop is a special way to wind down before a leisurely dinner. All the spaces were thoughtfully designed to encourage memorable days enjoying home-cooked delicious meals, sunbathing and cool dips in the pool, relaxing in one of the many shaded nooks, and relishing the country life with friends and family. This is more than just a place to stay, it is an experience of its own. The guardian, Preditt, made our stay even more special, with his warm smile, anticipating every need, and cooking incredible meals for our family. Located 5 minutes outside the town of Grottaglie in the southernmost region of the Italian heel. Closest airports are Brindisi, 52km away, and Bari, 120km. Guests have exclusive use of the villa with 7 bedrooms 12/13 persons. Peak Season (July/August) $1400/day, minimum 7 night stay. High Season (June/September) $1150/day, minimum 7 night stay. Mid Season (October/May) $925/day, minimum 4 night stay. Low Season (November to April) $800/day, minimum 4 night stay. *please check with property for up to date rates, as exchange rates fluctuate. This stunning estate is also available for events and weddings. Please inquire for more info. The guardian is an incredible cook and is available to prepare your meals and assist with groceries for an additional cost. 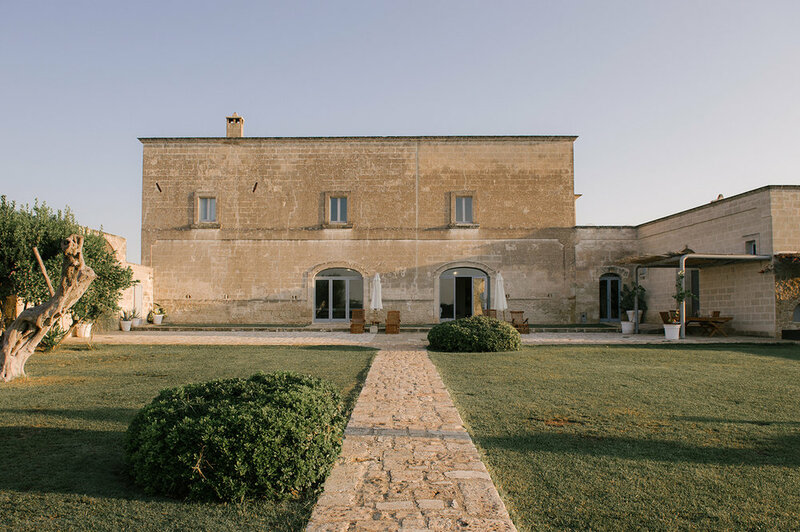 Masseria Anguilli Piccolo is just one of 7 spectacular properties designed by owner architect, Kristine Standnes. Albeli is made up of several uniquely superior venues scattered around the South of Italy, between the regions of Campania and Puglia. Albeli is a translational multidisciplinary project which takes inspiration from a rigorous study of the past whilst leading this knowledge to present and future creations. More information about the other properties can be found here. The estate is just outside the town of Grottaglie, a lovely town known for its ceramics. 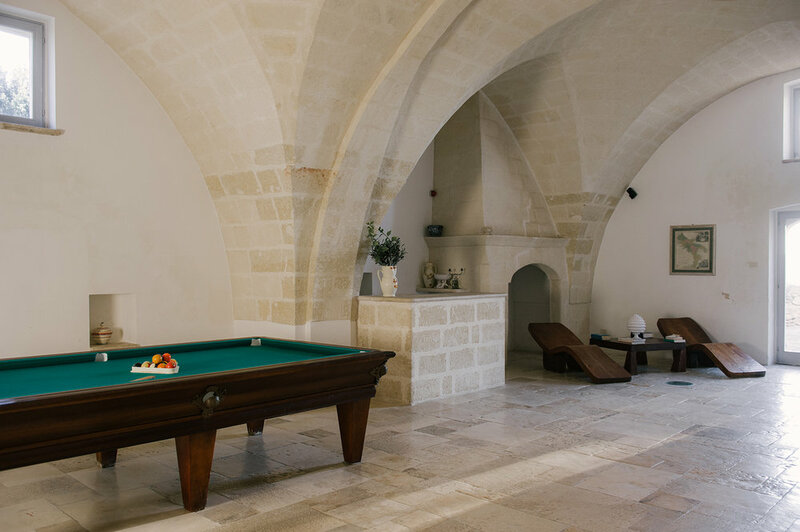 Other towns to visit nearby include Taranto (23km), Franca (19km), Locorontondo (29km), Cisternino (27km) and Matera (80km), a UNESCO heritage site. There are some lovely beaches on either coastline, Marina de Pulsano is 26km away on the Ionion Coast, while Paragrafo 25, Costa Merlata is 40km on the Adriatic Coast. The coast is also a great place for wind surfing, sailing, snorkeling and diving. Closer to the masseria, cycling is popular, with mostly flat roads with interesting landscapes of trulli and castles. For information visit their website and instagram.